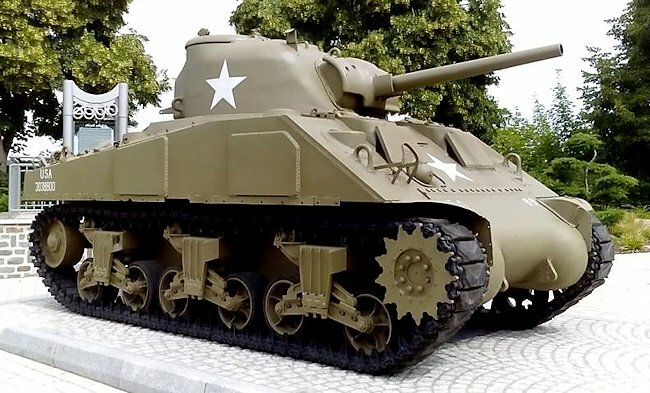 This Surviving Battle of the Bulge 1944 M4(75) Sherman Tank took part in the 1944 WW2 Battle of the Bulge in the Belgium and Luxembourg Ardennes. It has been restored and can be seen in the car park on the N12 at the Place des Martyrs in Wiltz. In 1968 War Museum was established in the mediaeval castle in Wiltz, Luxembourg. It was opened on 24 January 1970, the 25th anniversary of the liberation of the town of Wiltz. All the items on display have been donated by locals, returning ex-servicemen or have been found on the local battlefields. 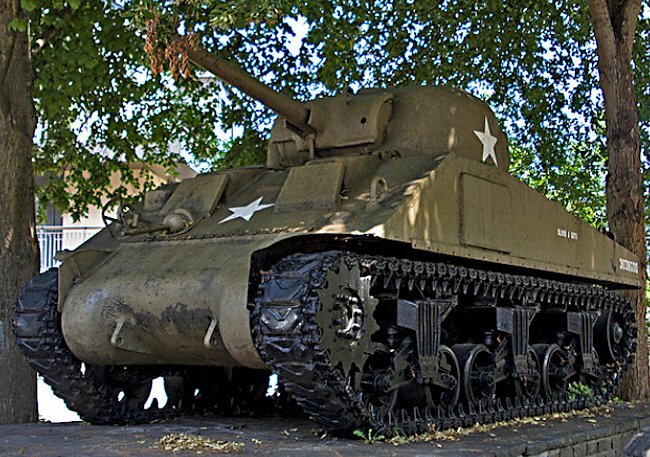 The American 28th infantry division captured the town on 10 September 1944. General Eisenhower stayed in the castle during this period. 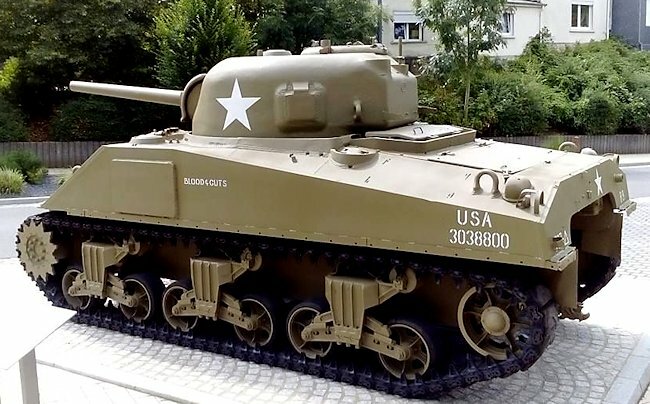 This Sherman M4 tank has a cast nose and turret but welded hull. 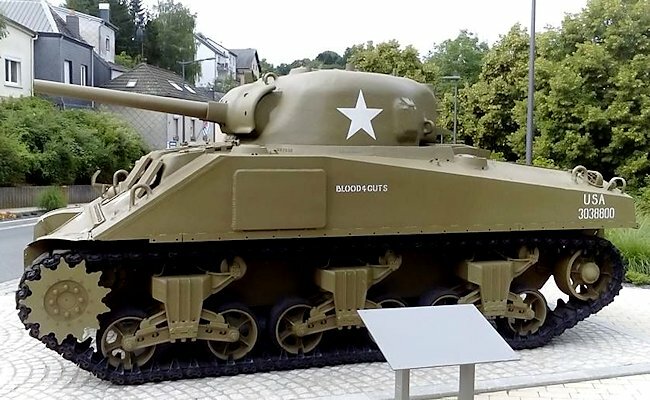 It has additional applique armour welded in front of the crew positions and it is nicknamed after General Patton, Blood and Guts. Notice that the side near the Driver's head position has additional armour plating welded to the side. Two smaller additional plates of armour have been welded on the front hull armour at head height for even more protection. 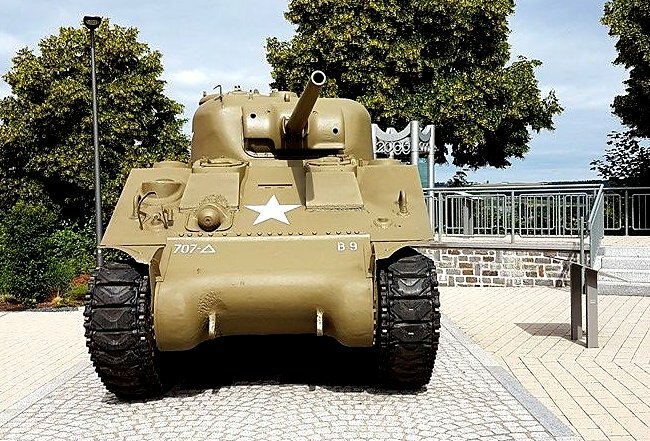 The Sherman M4(75) that was displayed as a memorial for the American Soldiers that fought to liberate this attractive Mediaeval town in January 1945 disappeared from its normal place in the car park by the Place des Martyrs at the junction of the Rue de la Fontaine and the Rue de la Montagne in 2015. It had been sent to the Vehicle Restoration Centre in the Bastogne Barrack to be given rust treatment and a new coat of paint. They tourist office said that the tank would not return until 2017. They were wrong. It was restored and returned to its original place looking like it had just left the factory in mid July 2016. Sherman tank crew comments - I hit a Tiger tank one day at least three times with an armour piercing AP shell and never touched him. There was no penetration. The shells just bounced off. He kept on coming. Then my loader accidentally threw a white phosphorous shell in and I hit that tank right in the front end and he stopped. They thought they were hit and penetrated and they thought they were on fire. We used the white phosphorous shell for markers. It burns and a puff of white smoke explodes. They were good for hunting range. We had the old type sights where you guessed the range and we used to use what we called bracketing shots. Some gunners would use high explosive to get their bracket. The first shell, you could see it hitting.